Somehow I managed to buy some clothes this month too, even though I said I didn’t have the money for it. I’m equal parts proud and ashamed over myself. 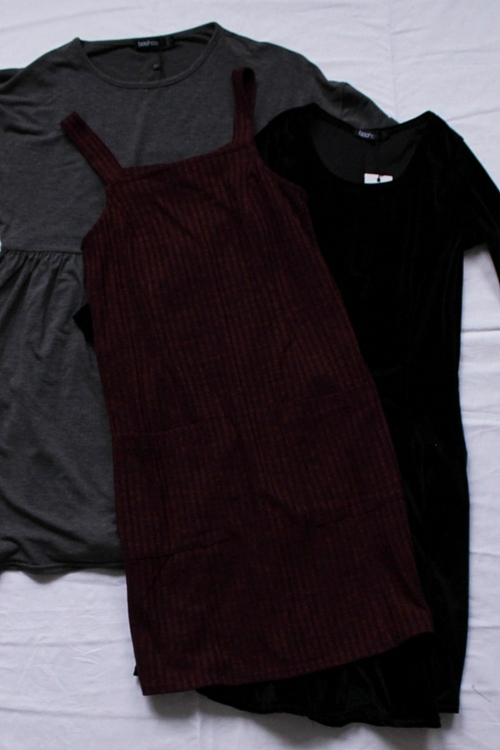 The first two pieces I got was from the Asos sale so they came to a very good price, and then thanks to this post by the lovely Robyn over at Phases Of Robyn I found the perfect pinafore dress so then I just had to get it. All in all I got five new pieces to my wardrobe and I couldn’t be happier about it. And I have gone from not having a single piece of clothing from Boohoo to having a little collection of them in just a couple of week, and that’s why I’m making this Boohoo clothing haul. Boohoo Clothing Haul: What did I buy, then? Black velvet skater dress and maxi shirt from Asos, and if you want to see how the skirt looks on me you can do that here. 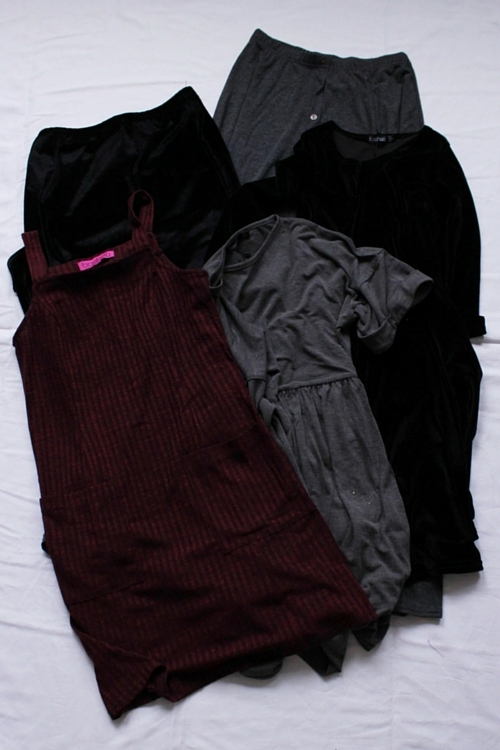 Grey button down maxi skirt, grey dress and dark red/purple-ish pinafore dress from Boohoos own site which I didn’t know about until a couple of days before I placed the order. I love how versatile these clothes are. Okay maybe not the black dress but it was on sale so that’s okay. And I’ve been looking for the perfect pinafore dress for years and this really is the perfect one for me, really want to find a semi-transparent black blouse to wear under it though. Always something new to buy, isn’t there? I’m very pleased with my first ever purchases from Boohoo and I’m pretty sure there will be more ones in the future. What’s your opinion on the brand? ← Wearing: Big Sweater And Overknee Socks.